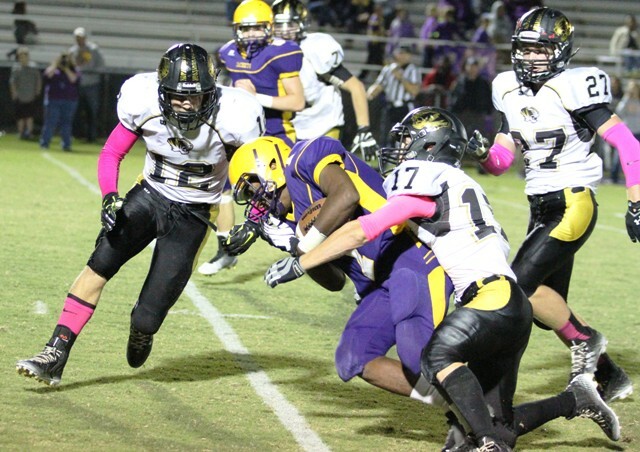 It was a game of streaks Friday night when the Tigers traveled to Hartsville to take on the perennial Class A powerhouse Trousdale County Yellow Jackets. Falling behind by 3 touchdowns early, DeKalb clawed its way back into the contest, at one point pulling within 6 of the Jackets, but a costly penalty late cost the Tigers a safety and, ultimately the game, 21-29. Jonathan Munoz stretching across the goal line. 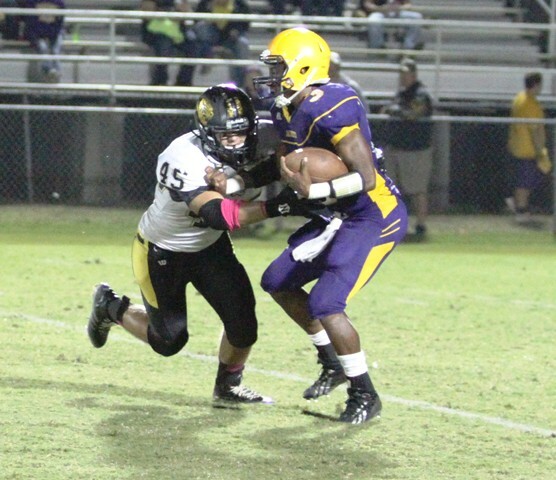 While virtually shutting down the Trousdale passing attack, the Tigers had no answer for the Jacket run game. 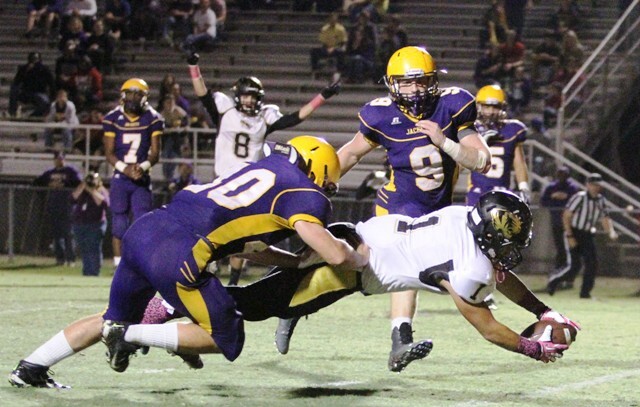 Led by sophomore Tanner Lannom, Trousdale was able to put up 419 yards on the ground against DC. 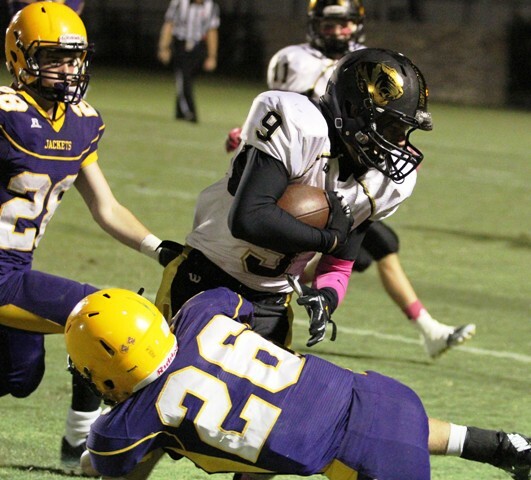 Lannom, who put up 154 yards on 14 carries, was one of 6 Trousdale backs to see action in the contest. Steven Jennings accounted for all Tiger touchdowns Friday night. The Tigers showed resiliency however, as the team battled back from an early hole, giving up 3 touchdowns in the first quarter. Hunter Stone and Lance Ball, who led the team in tackles on the night, seemed to get the Black and Gold Defense settled down after the disastrous first quarter to give Steven Jennings and the Tiger Offense a chance to bring the team back. Jennings, who went 9 of 25 and 131 yards and a touchdown passing, also led the team in rushing, running for 104 yards and 2 touchdowns on the ground in the contest. 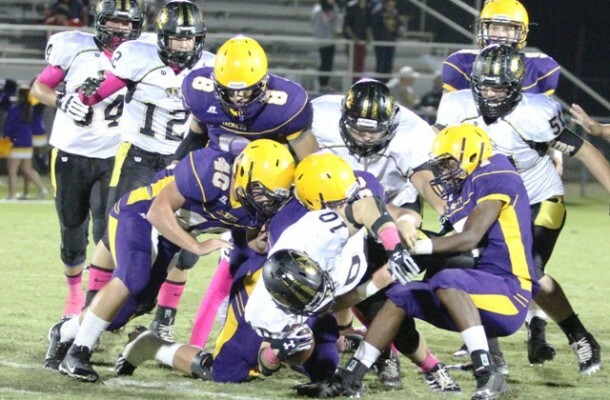 DeKalb watched Trousdale take the opening kickoff 87 yards to the end zone for a quick Jacket touchdown. Then was forced to punt and then let the Jackets move quickly back down the field on 4 plays before Austin Ford put the ball into the end zone again for the Jackets. Jennings seemed to be finding his rhythm on the next Tiger drive, but an errant throw cost him as Trousdale picked him off in the end zone, killing the Tiger momentum and drive. Seven plays later quarterback Marquel Claiborne broke off a 74 yard run for a touchdown to put the Tigers in a big hole with 23 seconds still left in the first quarter, 21-0. A.J. 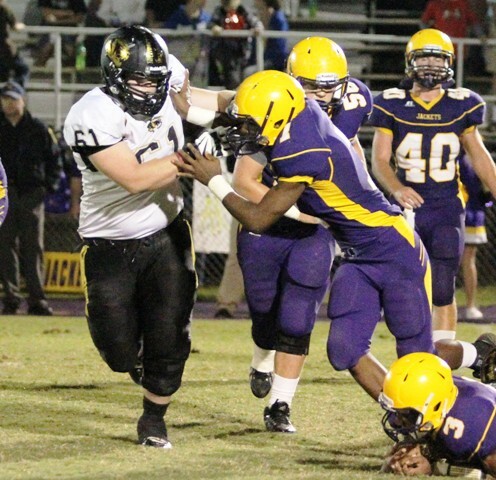 Mooneyham and Joey Moon combine for the tackle in Friday night’s game against Trousdale County. Jennings would bring his team back, however, putting together a 7 play 66 yard drive of his own, finding Jonathan Munoz from 17 yards out to put the Tigers on the scoreboard, 21-7 with 10:44 left in the second quarter. DC would force a Jacket punt and Jennings would take off from 42 yards out to bring the Tigers back close, 21-14 with 2:10 left in the half. Lance Ball had 9 tackles for DeKalb Friday night. The Jackets would mount another scoring threat as the half was ending, driving all the way down to the Tiger 6 yard line before Luke Boss sacked Ford, as time expired in the half. Torrential ran fell throughout most of the second half, not only making traction tough but also causing the football to become extremely slippery. After forcing a Tiger three-and-out, the Jackets managed a 10 play 82 scoring drive when senior Kenyan Harper put the ball in from 5 yards out. Kicker Ricky Harrison would miss the point after, however, and the Jackets extended their lead, 27-21. The Tigers would answer, though, as Jennings put together a 9 play, 66 yard drive of his own, finding the end zone himself from 16 yards out to put the Tigers back within 6, 21-27 with 2:39 left in the third. 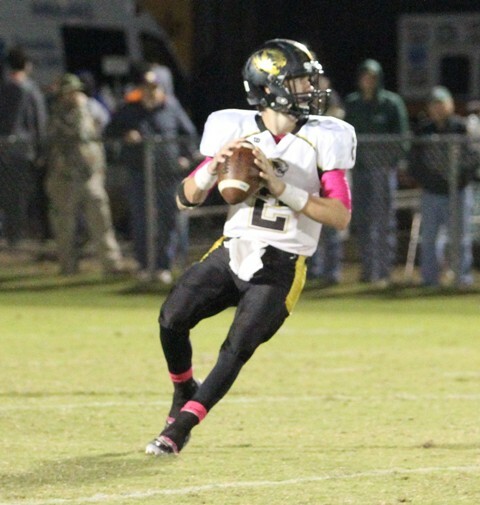 Austin Brown in Friday night’s game at Hartsville. The Tigers would force another Jacket punt on Trousdale’s next possession and seemed to have all the momentum as Jennings again drove the Tigers all the way down to the Jacket 13. DC couldn’t put it in though and turned the ball over on downs there. That drive looked to be very costly to the Tigers as Trousdale was able to seemingly move the ball at will, putting together a 14 play, 77 yard drive all the way to the Tiger 5 yard line before Lane Ball would force a fumble, to give the Tigers the ball again, and all the momentum, with the chance to win the game late. Tiger disaster proved to have one more act though, as Jennings was flagged for intentional grounding in his own end zone, to give the Jackets a safety, and ultimately the win, 29-21. For the game, behind Jennings, Luke Boss ran 8 times for 38 yards in the contest. Aaron Patterson caught 3 passes for 35 yards and Jonathan Munoz had a touchdown in the game. Luke Boss caught 2 passes for 47 yards, Dalton Halfman added 2 catches for 20 yards and Austin Brown had a catch for 15 yards. The Tigers will travel to Jamestown this Friday night to take on York Institute and end DeKalb’s marathon of away games. Game time is 7:00. 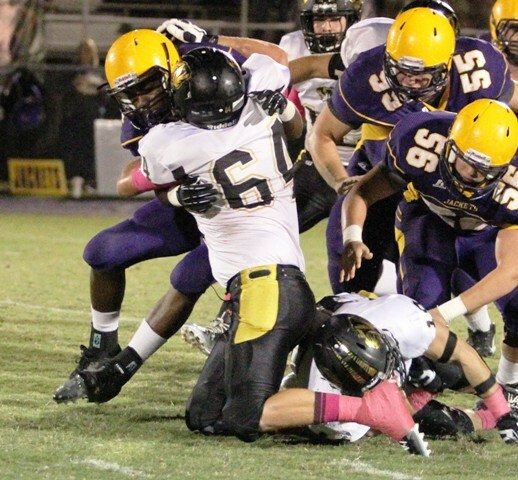 Hunter Stone helped lead the Tiger Defense Friday night.